Being involved in rescue, you hear a lot of horror stories that make you wonder how people can be so cruel to their animals. Believe me, I've seen surrender applications come through my email that make you wonder if you couldn't find a way to drop the human off at the shelter instead of the dog. This is one of those times that reminds me we're all in this together and our world is facing hard challenges. This is one of those times that makes me happy to know there are rescue groups out there to help ease the landing for some old friends whose human-folk did everything they could but just couldn't make it work. Allow me to introduce you to Casey. Photo courtesy North East All Retriever Rescue. Casey is almost 12 years old and has found himself homeless because his family just couldn't make ends meet any more. They did the best thing they could for him: they found a rescue group where Casey will live in a foster home with a caring foster family until his new forever family comes along. At 12 years old, Casey would have had a difficult time had he just been dropped off at the county shelter. 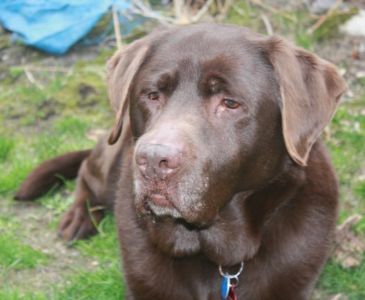 Now, thanks to North East All Retriever Rescue (NEARR), not only will they make sure he's in a good foster home, but they will ensure his new forever family provides regular updates about him so his previous family can sleep at night knowing he's loved and in the best possible home (if not theirs). This old boy is mellow and sweet and so ready to share the couch with you. You can view his entire profile on the NEARR website. And if you don't happen to have room in your life right now for a big lovable lug, maybe you could push one of those buttons waaaaaayyy down there and share his story so someone who does have room can find him? How sad. I know there are many people out there struggling to make ends meet. When you cut everywhere that you can and still more needs to cut, what do you do? I've cut the dogs food bill a bit by not buying the beef raw food anymore. It is too expensive. Instead I am supplementing when I find a good deal on beef. It would break my heart to have to give up a dog after 12 years, but they did right by him and I hope someone takes him home, so he can live out the rest of his days with a family. How very sad. I applaud the family though for making the right choice. I can't imagine giving up Nola ever, and I've only had her a ear and a few months. But after 12 years I can't imagine the choice gets any easier. Makes me realize how blessed I am to be able to provide everything she needs. I hope he finds his forever home! That is such a sad thing to happen but all too common these days. This is happening more and more in UK too. The shelters here can barely cope with the amount of animals that are being surrendered because people have lost their homes. I hope Casey gets the home he deserves and some family will be in for a treat having him for a companion. Such a sad thing and it is certainly understandable as to how it can happen these days. I hope someone can find room for him soon! I can't imagine how hard that was on the family and Casey! Thankfully they did the right thing. I sure hope this cuddle bug finds his forever home soon! I hope he finds his family (and new couch!) soon. I'm glad rescue can be there for dogs like Casey and his family. I can't imagine how hard it must have been to give him up. There are so many dogs in rescue/shelters through no fault of their own, thanks for featuring him. Hi Jodi, you know the very first transport I ever did was picking up an 8 year old dog from his family that had surrendered him to use because they were losing their home. It's a miracle I ever did another transport after that because it was horrible. They were crying, I was crying, my husband was crying. I think I cried for a week. But you're right - what do you do when you've done all you can? It's not an easy world right now. I can't imagine what it feels like to make that decision and I hope I never have to find out. :( It is a good reminder to count our blessings. It's one of the worst aspects of the volunteer work I do with this group. It's one thing to pick up a dog from a shelter to bring it into our rescue knowing it's going to a foster family and at some point their forever home but this, taking a dog from it's loving family - your heart breaks for the dog, for the family, for the difficult times we live in... Even when you know you're really there to help, it doesn't really feel that way. They did do the right thing and I hope and pray the family can take some comfort in that. I've seen reports with this group where the dog has passed 10 years later and the "new" family has sent a special note of condolence to the "first" family so at least these folks will always know Casey is happy and loved. Oh I know - once upon a time, this dog would have landed in much dire circumstances. It's heart-breaking but encouraging at the same time. I've had to take an old dog out of the arms of his loving family once. It broke my heart - it still does. But I'm glad these groups exist to help ease the transitions.